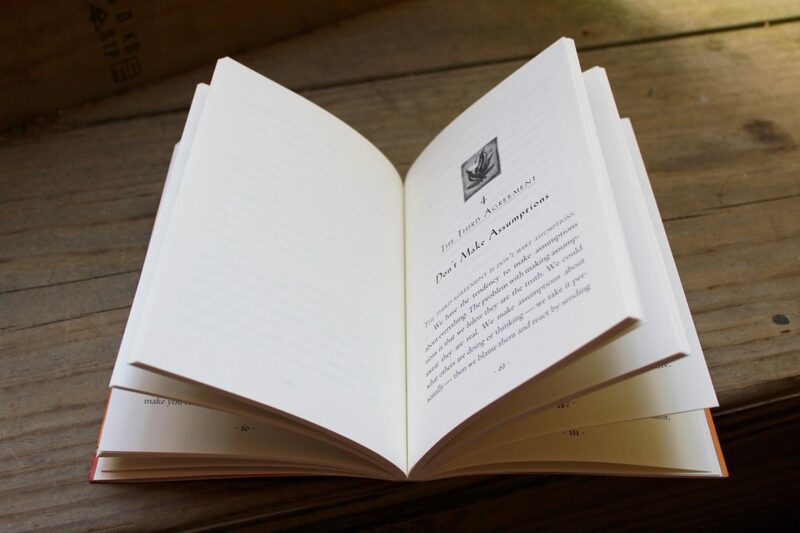 There are only a handful of books that I would consider truly life changing, and this little book is so profound, I felt I needed to dedicate a whole post to it’s beautiful message. 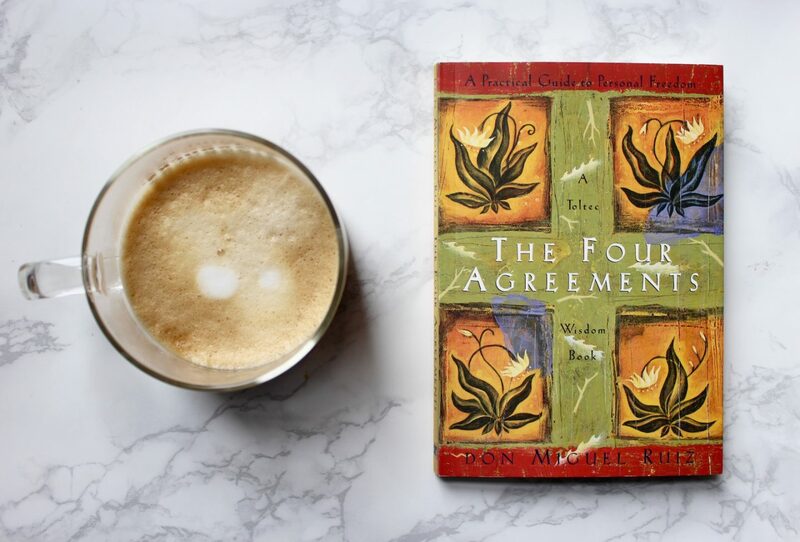 In such a simple format of laying out four agreements that we all can live by to achieve lasting peace and happiness, Don Miguel Ruiz has passed on this ancient Toltec knowledge to us that has the power to completely change the way we understand ourselves and one another. I had heard about this book for years before purchasing it, and I’m kicking myself for not reading it sooner but I guess this was the right timing for me to discover it and absorb its concepts. Ruiz begins the book by discussing how we are always dreaming—whether the mind is awake or asleep, it dreams 24/7. When we are born, we are taught how to dream by our parents, schools, and religions. We soon learn a whole reality (or dream) without even the opportunity to choose our beliefs. We just agreed with what was told and shown to us. We store information by making “agreements” with ourselves. If someone told us we were stupid, ugly, too this or that, and we took those words in as an agreement, they entered our belief system and we began living by that rule. The foundation for our whole belief system is laid when we are children, learning how to behave and what’s acceptable in society until we all become “domesticated.” We develop an inner Judge who judges everything including ourselves, and makes us feel guilty or ashamed when we do something against our belief system, and an inner Victim that receives these judgements and carries the guilt and shame. Because of this system we’ve built to continue the “dream,” it is very difficult to challenge our own beliefs and break our agreements. 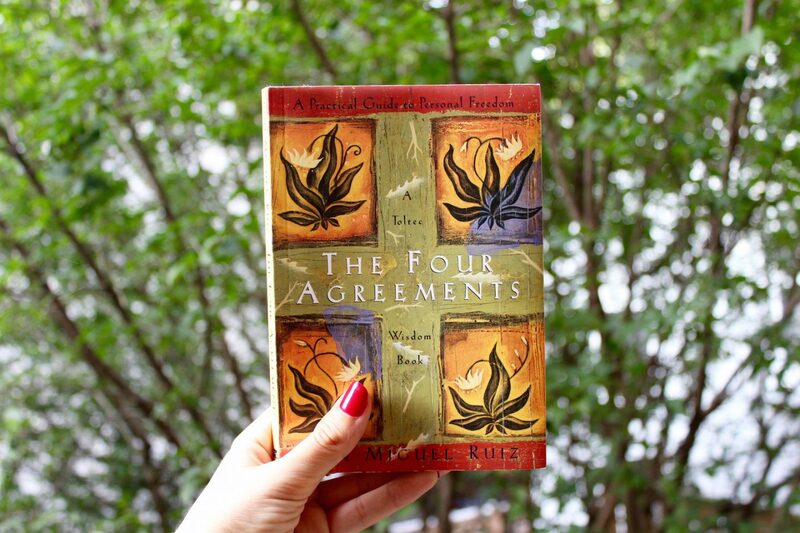 Ruiz suggests that we need only live by four agreements in order to find inner peace and happiness. The dream of the planet is just a dream. It is not even real. If you go into the dream and start challenging your beliefs, you will find that most of the beliefs that guided you into the wounded mind are not even true. You will find that you suffered all those years of drama for nothing. Why? Because the belief system that was put inside your mind is based on lies. Ruiz calls this agreement the most important and most difficult to honor. One idea that really stood out to me in this section is that we are the only species on the planet that can speak, and we often throw around our words carelessly—in gossip, in negative comments about ourselves, in empty promises to others. He goes on describe the word as a magical tool but also one that can be used to do harm. Like how we take in and make new agreements, the word can enter your mind and create or break agreements. Immediately after reading this section, I began to think much more seriously about what I say to others and how carefully to choose my words. I love this one and I keep it in mind daily. What you’re opinions are of me, positive or negative, is only a reflection of you, not me. If someone says “you’re the best” or “you’re the worst” it is only a reflection of their mood and/or issues with themselves and if you know who you are, neither should affect you. Everyone’s opinions come from their personal belief system, which has nothing to do with you. You have to trust yourself and choose to believe or not believe what someone says to you. I never realized how frequently I was making assumptions until I sat and thought about it. We assume what others are thinking, we misunderstand, we take it personally, and therefore make drama for no reason. We have a constant need for answers, which is why whether or not others tell us information, we make assumptions to reach conclusions. We assume that others think the way we think, feel the way we feel, judge the way we judge, and abuse the way we abuse…And this is why we have a fear of being ourselves around others. Because we think everyone else will judge us, victimize us, abuse us, and blame us as we do ourselves. This agreement is simple, but profound. Ruiz points out that our best varies from moment to moment as everything is changing, but as long as we are always trying to do our best, we are on the right path. He also notes that this does not mean necessarily meditating for hours a day or worshiping religious idols, unless this feels good for you. The freedom we are looking for is the freedom to be ourselves, to express ourselves… The worst part is that most of us are not even aware that we are not free. There is something inside that whispers to us that we are not free, but we do not understand what it is and why we are not free. The problem with most people is that they live their lives and never discover that the Judge and the Victim rule their mind, and therefore they don’t have a chance to be free. I would highly recommend this book to anyone curious to try a new strategy for finding and maintaining balance and peace. Have any of you read this book? If so, what are your thoughts? I definitely want to check this out; it sounds amazing! Thanks for the review and the recommendation! I’ve been meaning to get this book for a while now! Thanks for sharing. I will definitely be picking this up soon, it seems it would be super helpful. I’m so happy to hear that, you won’t regret it! That’s true. I’ve read a bit about Buddhism actually and gone to some meetings and I really identified with the philosophy. I recently read this book and found it to be such a wake up call. I will definitely read it again too. it’s the little things in life that we tend to overlook but they could change our attitude and outlook on life in such a tremendous way. Great article. I completely agree. I think it will take a few times of reading for everything to really sink in for me too. But such valuable information that just feels true, in my opinion. 🙂 Thanks for stopping by! Thanks for the recommendation – I can’t wait to get my hands on a copy! I can’t wait to to read it! Nice post. Thanks! It sounds like a great book, will definitely be keeping my eyes out for it! Thanks for the great review! First of all, thank you for liking my most recent post. It means much to me ❤ Wow, these are some life lessons. I might read this book in the future, sounds like I can learn a lot from it. 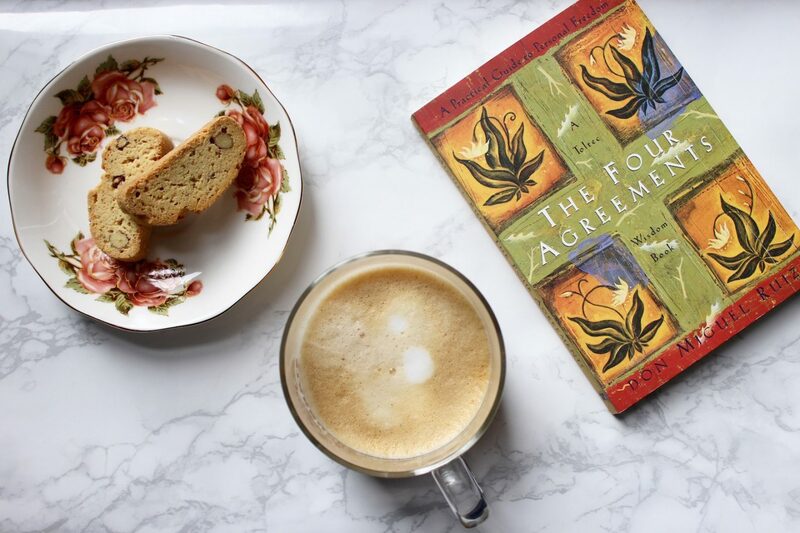 I was going to make a post on The Four Agreements as well. My life has been impacted since I read it. Glad to see that it has impacted you as well. Great post! I used to carry this book around with me. Amazing! Hello! Firstly I want to thank you for liking one of my posts. It felt so good that I could reach another blogger. Secondly, I want to say thanks for sharing your experience with this book with me. You really made me read this one as I find myself seeking for balance and less drama. Hopefully, The 4 Agreements will impact myself as much as it did with you. Finally, I want to let you know how much I appreciate your blog and your style of writing. I just started to read this! I’ve only finished the first chapter and I am already in love! How funny! I definitely need to reread it a few times myself before the concepts fully sink in! Time to rad it again. It’s been a number of years. It’s one of those books that you can revisit and be feed again. Have you read Blue Like Jazz? It’s my favorite. Putting this next on the reading list! Yay! It is a MUST read!! For sure. One of those books you can continue to read for years.